- Clear up the initial cut scenes, save at the entrance, and check your map. Your road is north; if you try to go northeast, Lucil and Elma will bar your path. Drat. - Follow the tree branches until you come to a Guado. He's standing in front of a treasure chest containing 2,000 gil. - Keep following the path until you reach the second screen of the forest. Partway through you'll reach a loop on your map. Beside a tree at the top of this loop is a chest; inside are three Phoenix Downs. - Eventually? Barthello. Feel for him. - Just past Barthello you'll meet a strange bird-like creature. It will trigger a butterfly-catching minigame whereby you must catch the blue butterflies in this section of the forest while avoiding the red butterflies. Catch all seven and you'll unlock a chest containing an MP Sphere. Heed the bird's warning - the red butterflies summon above-average fiends for you to fight, and they'll put a serious hurt on. You're also pretty much guaranteed to fail if you hit one, so, y'know. Tread lightly. - Next screen to the east. A short ways in you'll see a butterfly hovering next to a tree; behind the tree is a chest containing a Remedy. - Near the end of this section is another rainbow butterfly course. It's a bit trickier than last thanks to some wonky camera angles, but you should have more time left over at the end. One word of caution: as soon as you catch the last butterfly, STOP MOVING. It's sitting riiiight on the boundary between one screen and another, and if you move just a bit too far you'll screw up your progress and have to walk back to start over. Stupid butterflies. Complete this course to gain an Ether. - After buying from O'aka, take the dead-end path to his right. Keep hitting the X button as you run along it and, eventually, you'll find a hidden Al Bhed Primer Vol. XV. - Continue north to a cut scene. 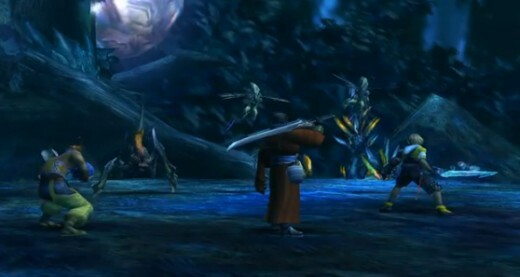 Auron will bring you to a new area. Check it out... aaaaand... yep, you guessed it. This is a tricksy battle until you get the hang of countering magic for magic. Spherimorph on its own uses a series of physical attacks to beat you down, none of which are too brutal. The problem here is that return attacks from you have a tendency to restore Spherimorph's HP, also prompting it to use a base-level spell on its attacker. - Winning will earn you Jecht's Sphere. Ah, memories. There are now more Jecht Spheres across Spira, and you can find 'em in new locales and in places you've already visited. Auron will also learn the Shooting Star Overdrive in the wake of this discovery. - Return to the previous screen. You can now access the path where you found the Primer earlier; it will lead back to the beginning of the forest, with a great deal less trouble on the way. - Continue north, following O'aka, to escape the Woods. Welcome to the next stage of your journey: Lake Macalania, and the Temple beyond.